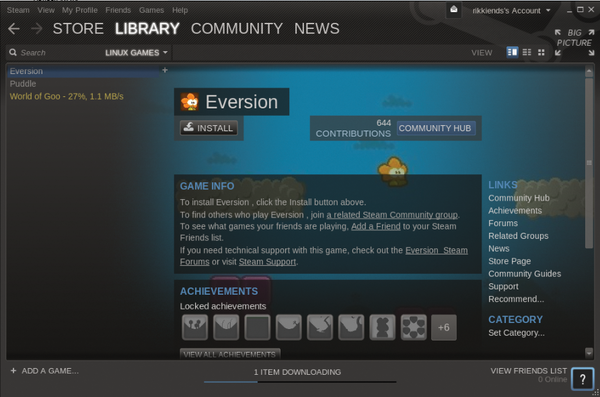 On February 14, 2013, Valve announced the official release of Steam for Linux and celebrated the event by offering discounts from 50% up to 75% off the price of Linux titles for a week. With the exception of board games, I haven't been much of a gamer since the old-school Pac-Man days, so I downloaded Steam to see what the fuss was about. 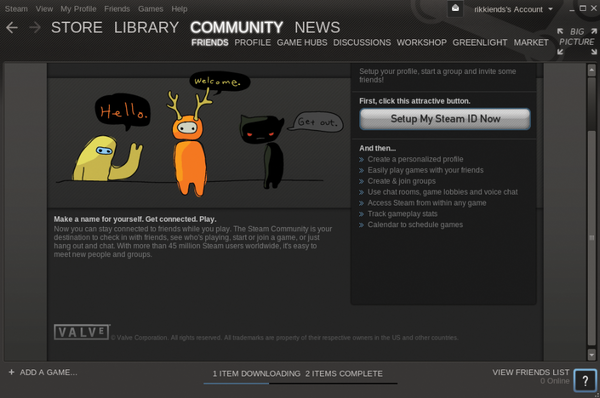 Ubuntu users will find Steam in the Ubuntu Software Center, which makes downloading and installing it a breeze . You'll need to have a 1GHz Pentium or Athlon XP1500+ with 512MB of RAM or better, Ubuntu 12.04 or 12.10, a recent model graphics card, and at least 5G free hard drive space . 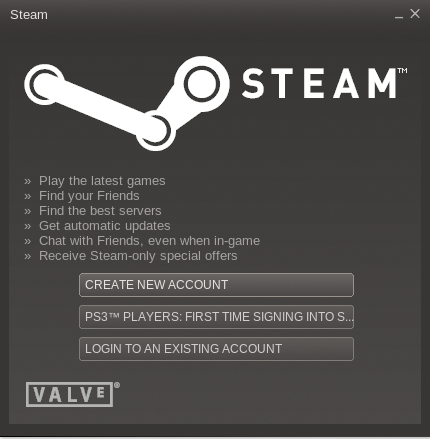 After installing Steam, you will be walked through the process of setting up your user account (Figure 1). If you already have an existing account, you can log right into it. Figure 1: Downloading and installing Steam is a breeze. Then you can set up your account. When you start Steam, you'll see a Store tab, which is where you can buy new games, and a Library tab, which is where you'll find your current collection of games. In my case, I'm new to Steam so my library is empty (Figure 2). Games have come a long way since I played Pac-Man at the laundry mat when I was a kid, and I quickly realized why Linux users were so excited about Steam. I decided to take advantage of the short sale on games and I bought World of Goo , Eversion , and Puddle . My system told me it would take 10 hours to download my three games, so I started with World of Goo, which actually took less than a minute to download. All three games downloaded and were ready to play within less than five minutes (Figure 3). 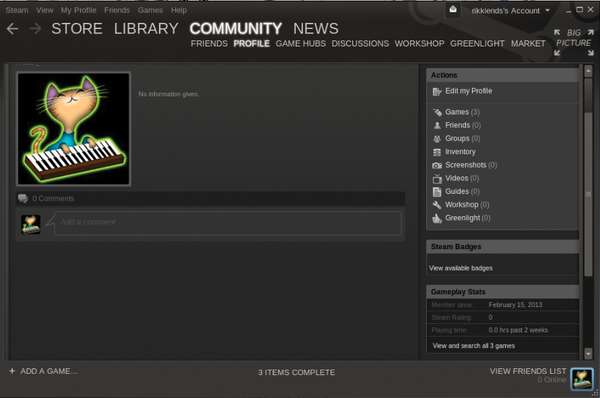 Figure 2: Navigation in Steam makes it easy to buy games or find games in your collection. Figure 3: Eversion installed in less than one minute, even though the system told me it would take 17 minutes. Under the Community tab, you will be able to edit your profile and add an avatar. You can use your own image or choose one of the existing game avatars (Figure 4). Figure 4: Create your avatar as you set up your profile. Here you'll also be able to find friends by name or email address and connect with them through your account (Figure 5). You can create and join groups, chat, and even schedule games. You can even connect your Facebook account to Steam (Figure 6). Figure 5: The Community page provides an overview of your profile and allows you to connect with friends. 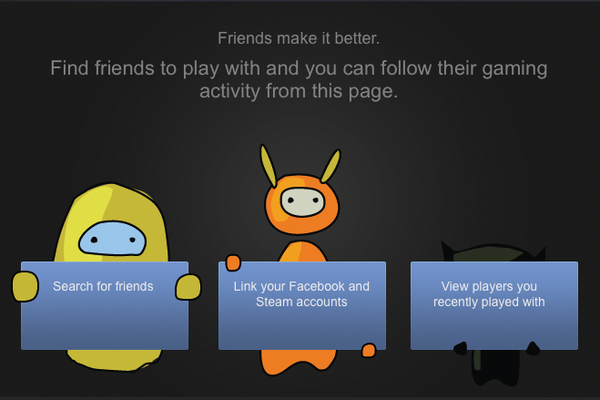 Figure 6: Connect Steam with Facebook through the Community page. In the Actions window, you also can edit your profile, see your game collection and groups, and access screenshots, videos, and guides. The Gameplay Stats window provides details about how much time you spend playing games on Steam. 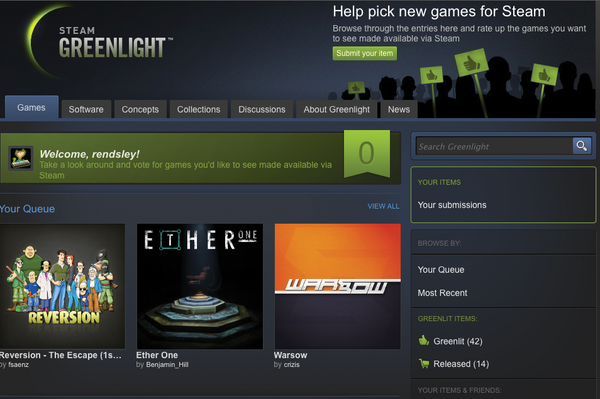 Also, the Steam Greenlight feature is a fun way to try new games and then vote on games that you'd like to see made available via Steam (Figure 7). Steam Greenlight let you keep track of games you've voted on, follow various items, mark your favorites, and see your friends' favorites. Figure 7: The Steam community votes on games that will be available via Steam.